Karou has been filling her sketch book with strange creatures for so long that her few friends have treated those creatures as a part of her life. The strange wishmonger Brimstone, who spends his days stringing necklaces of human teeth, is the most intriguing; but Issa, the snake charmer, is a close second. Even as Karou reaches adulthood and lives in Prague, her good friend and art school buddy, Zuzana, enjoys Karou’s fantastical tales, right down to Karou’s assertion that her blue hair is real and not dyed. Zuzana is a level-headed young woman. She gives Karou advice about her rotten ex-boyfriend, Kaz. And yet, she feels that Karou is not as honest in her sharing of her personal life as she could be, that she holds Zuzana at a little distance, making frequent trips out of town and never saying what her business is. Zuzana is right, of course. Karou has secrets. All of her fantasy characters are very real—are, in fact, the only family she know. And while she is keeping this important secret, she feels that important secrets are kept from her. Does Brimstone know who she is and how she came to be a part of his life? Why does he string teeth all day? And why does he send her on dangerous missions to trade for teeth, to bargain with a grave robber? When Karou is transported to Marrakesh and finds herself looking into the eyes of the supernaturally beautiful Akiva, she doesn’t know it, but the world of answers has just opened up. Meanwhile, scorched black handprints are appearing on doorways, endangering Karou as they close the portals that open on her missions. High school housekeeping: Fans of fantasy and paranormal romance should love Daughter of Smoke and Bone. I got around to reading it because I’m looking for something for our Hush, Hush fans here at school. 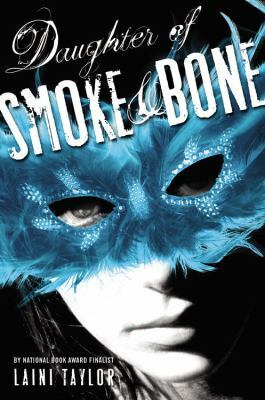 Teens who talk books with me know that paranormal romance isn’t my first choice for reading, so I want to add that Daughter of Smoke and Bone was a pleasant surprise. The writing was wonderful, the kind of writing I hope you read lots of as a teen and the style of which I hope you’ll absorb. Add to that some great fight scenes, deep secrets coming to light and throw in profound betrayal. You have all that you need to read nonstop and move on with the series. Daughter of Smoke and Bone is an action-packed take on the Romeo and Juliet theme of star-crossed lovers and another opportunity to ask and answer the eternal question: does love conquer all? This entry was posted in Fable/Fairy Tale/Fantasy, Family Problems, Fiction, Over 375 pages, Romance, Supernatural, Young Adult Literature and tagged angels, artists, book reviews, chimaera, chimera, Daughter of Smoke and Bone, devils, Greek mythology readalike, mythology, paranormal romance, Prague (Czech Republic), romance, strange creatures, supernatural, YA fiction, YA literature. Bookmark the permalink.